In an effort to synergize the phenomena represented by Tim Tebow’s success in the NFL and that of recent NBA mega-story Jeremy Lin (namely, devout religious views and asynchronous ethnicity), the San Jose Sharks have announced the signing of Liberian-born left winger Ateso Ekwensi. 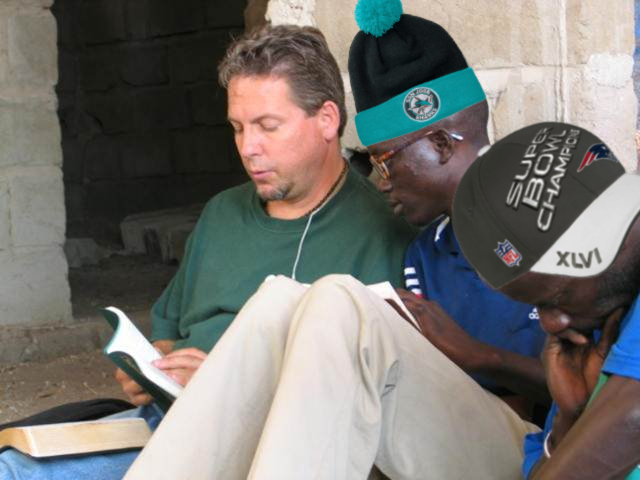 Ekwensi- pictured below cultivating his now-fervent love of Evangelical Christianity- will report initially to the AHL’s Worcester Sharks for a conditioning assignment. He is expected to be in the NHL in time for the Sharks playoff surge. I love the Arturs Irbe tag. Growing up in the 90's I had like eleventy billion hockey cards with him and his plain ol' Jofa goalie helmet.